Design and construction of a 1320 sq. metre office fit out for Robert Walters on Level 41, 385 Bourke St Melbourne (top floor). 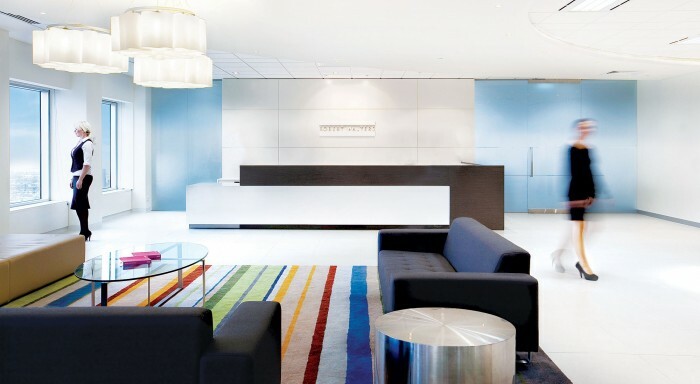 It was stated in a recent “press release” that the Robert Walters office fit out was the most prestigious office fit out to designed and built in the CBD of Melbourne for the second half of 2011. ODC Design has worked in partnership with the Robert Walters Group for over 20 years with 2 major office moves in St. Kilda Rd in the early to mid 90’s and a major move in 2000 to the CBD with another office refurbishment in 2005 and completely new office at 385 Bourke St in October 2011. The brief required a very large reception, waiting area, 2 large boardrooms with fully interactive video visual screens, high end finishes to the front of house area, including a custom rug, 9 interview rooms, testing room, 3 offices, client kitchen, disable toilet, staff breakout area, 143 workstations to consultants work zone and accounting area in this open plan environment.